ADDIS ABABA , May 3 2013 (IPS) - A rebel coalition in Sudan has declared war on the government less than a week after it attacked Sudanese forces. “Now there is a fully-fledged war in the new south of the north,” Yasir Arman, a leader of one of the armed groups in the alliance, told IPS, adding that the rebels now control a southern stretch of the country. Rebel activity had previously been restricted to southern and eastern Sudan. But the Apr. 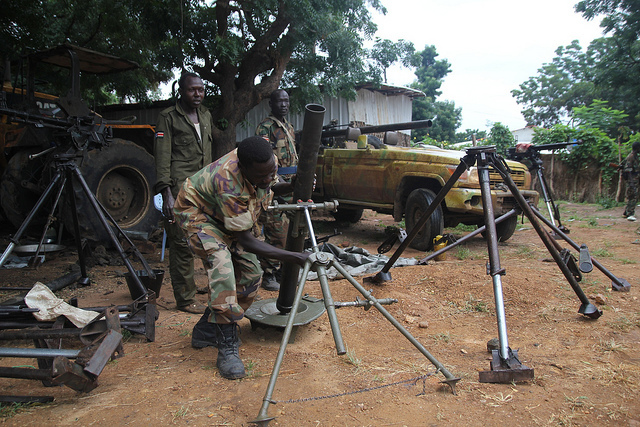 27 attack by the Sudan Revolutionary Front (SRF) in North Kordofan, which is 482 km from Sudan’s capital Khartoum, was the first full-on offensive to be launched in central Sudan. 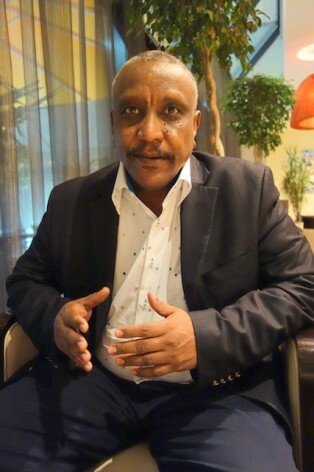 “Now we are fighting under one command, and we have one unified political leadership,” Arman, the secretary general of the Sudan People’s Liberation Front-North (SPLM-N), said in an interview at a hotel in neighbouring Ethiopia’s capital Addis Ababa. The SRF is made up of insurgent groups from Sudan’s western region of Darfur, including the Justice and Equality Movement (JEM) and the two main factions of the Sudan Liberation Movement. The SPLM-N, which is also part of the SRF, is from South Kordofan and Blue Nile states, in south Sudan. Previously, the groups had fought relatively independently, with the Darfuri rebels’ desire for an Islamist state being a main obstacle to forming an alliance. When the JEM gave in to the SPLM-N’s offer to create a secular state in Sudan, once President Omar al-Bashir is deposed, the alliance was formed in November 2011, and it has seemingly grown in strength ever since. The SRF’s core aims are for the formation of a new transitional government of national unity, the end to the marginalisation of the peripheries, and the installation of a decentralised federal system based on a secular constitution. They have also stressed the need for land rights and support for pastoralists. On Jan. 5, the SRF reached out to opposition parties and civil society groups, and signed a “New Dawn Charter” in Kampala, Uganda, which calls for an inclusive transition. “We believe that the international community’s response should be to look for a new mechanism to end the wars in Sudan. Not by piecemeal solutions. If the National Congress Party (Sudan’s ruling party) is allowed to continue its policies, then Sudan will never have stability. Stability lies in having a new blueprint which will address the core issues of Sudan,” Arman said. Following South Sudan’s secession in July 2011, South Kordofan was left as part of Sudan, but an agreement was reached to allow the residents to vote for their future. However, the SPLM-N took up arms in July 2011, following what they deemed to be a fraudulent election to choose a state governor and state assembly for South Kordofan in May 2011. They alleged that the Sudanese government rigged the vote in order to appoint their chosen candidate, Ahmed Haroun, as South Kordofan’s regional leader. At the time of his interview with IPS, Arman and an SPLM-N negotiating team were in Addis Ababa for talks between the rebel group and the Sudanese government, which quickly ended in deadlock. According to Arman, Khartoum is not interested in finding an overall solution to the conflicts but instead is looking to co-opt the various groups individually into working under the regime’s system – a system they reject. The report also argued, however, that the SRF could provide a great opportunity to broaden local negotiations to the national level and finally address the root causes of Sudan’s conflicts. It explained that if negotiations only partially address political marginalisation of the peripheries, calls for self-determination may well increase. The main obstacle to achieving peace, said Arman, was a lack of will by Sudan’s government to engage all the rebels as a whole and address the real root causes of the conflicts. Until either side backs down, or a middle ground is found, it appears that war will continue to rage between the two sides. Arman said that SRF troops are still in North Kordofan and are preparing for more attacks in the area. “I believe the balance of forces now means that our troops will have more gain on the ground in the coming two weeks. The government is preparing, and pulling their troops from all over Sudan; we are also preparing,” said Arman. According to James Copnall, Sudan expert and author of “A Poisonous Thorn in Our Hearts: Sudan and South Sudan’s Bitter and Incomplete Divorce”, the location of the recent attack is significant as it took place on the road between Al Obaid, the capital of North Kordofan state, and Sudan’s capital Khartoum. “It seems likely it was chosen as a target to send a threatening message to Khartoum about the rebels’ capacities,” Copnall told IPS. Similar sentiments were echoed by Jonah Leff from the Small Arms Survey, a research project that provides impartial information about all aspects of small arms. “I don’t doubt that the SRF has the capability to reach Khartoum, but I doubt very much that they would have the might to sustain a fight against Khartoum’s comparatively strong security apparatus,” Leff told IPS. But with a new front in North Kordofan, NGOs are worried civilian residents of this state will now bear the brunt of the government’s crackdown on the SRF resistance. A point of clarification that was notably omitted in your article concerning the proverbial “spark” of the failed South Kordofan governor’s race: Ahmed Haroun is indicted by the ICC for war crimes and crimes against humanity in Darfur, and helped to orchestrate the first genocide of the Nuba people that the media works so hard to keep secret. It is impossible that Ahmed Haroun be elected in South Kordofan, and it was documented as false, but the Carter Center prematurely validated the clearly fraudulent and failed election. Abdel Azziz, the other “contender” in the governor’s race, is a literal hero and legend in the Nuba Mountains, and he was seeking to challenge the results through the courts when Khartoum came to forcefully disarm the Nuba army that has been defending their people from this genocidal regime. A “small detail” that you might have considered in your analysis.